Pictured are three WILLFULLY IGNORANT American citizens who in my opinion would prefer jumping off a cliff rather than speak about America’s [potentially life scarring] African American Culture of Child Abuse & Emotional Maltreatment responsible for many Obama White House guests and friends composing American music art HATEFULLY demeaning and denigrating black or African American teen girls and women, aka the MATERNAL HALF of our population, as less than human *itches and *hores or “hoes” unworthy of basic human respect! Here’s what we know about the attacks on law enforcement in the city of Dallas. In December 2015 President Obama invited to the WH popular American urban storyteller & recording artist Kendrick Lamar. In his music & public interviews Kendrick revealed (snitched) that THROUGH NO FAULT OF HIS OWN, he, his siblings & numerous cousins were raised, nurtured, socialized & from a young age CONDITIONED by Emotionally Disturbed, Criminal Child Abusing, Shotgun Toting, Drug Peddling, Violent Family & Community GANG members to accept & EMBRACE the Gangsta/Street Culture responsible for causing so much emotional & physical harm (or worse) to peaceful Americans residing in struggling communities…as well as depriving kids like Kendrick, the late Tupac Shakur & Freddie Gray, or Shawn Jay Z Carter & the late Christopher Biggie Smalls Wallace from enjoying a SAFE ‘Average Joe’ American childhood that EVERY American kid is entitled to experience. Kendrick speaks about experiencing Childhood Trauma, witnessing the roots of POVERTY, MASS CRIMINAL CHILD ABUSE & MALTREATMENT, UNJUST HUMAN OPPRESSION, violent felon family & community members who intentionally & recklessly ignored the well being of their children, UNJUSTIFIABLY DEPRIVING American kids from enjoying a home & community environment where they feel SAFE, loved & cared for. During a December 29, 2015 NPR interview, Kendrick recalls being a FIVE-YEAR-OLD CHILD witnessing his “FIRST” drug related “SHOTGUN” homicide right outside the home where he, his siblings & numerous cousins were UNJUSTLY OPPRESSED & DENIED BY THEIR CRIMINAL PRIMARY CHILD CARETAKERS, A CHILD’S RIGHT & ABSOLUTE NEED to feel SAFE, loved & cared for during a critical period of their human/childhood development. After ADMITTING his primary childhood caretakers are “living wild,” Violent Felon, Gun Toting Criminals who peddled life-sapping ‘people & community’ harming dangerous drugs to their depressed, self-harming neighbors, most likely regardless of their neighbor’s AGE, emotional or physical condition, the adult Kendrick Lamar CONTINUES HATING THE POLICE for trying to protect his peaceful neighbors from ANTI-SOCIAL behaviors embraced by the EMOTIONALLY DISTURBED, SELFISH, CHILD ABUSING CRIMINALS Kendrick & the kids in his immediate or extended families were raised & nurtured by. I realize witnessing human grief & violence at a young age sowed the seeds for Kendrick maturing into an emotionally scarred & troubled human being, though today he is an adult who despite experiencing depression, has no legit excuse for NOT knowing difference between right & wrong. I have NO DOUBTS Kendrick is only one of untold numbers of African American children severely impacted by CHILDHOOD TRAUMA that far too often results with depressed kids maturing into depressed, angry, frustrated, sometimes suicidal (NY Times May 18, 2015 – Rise in Suicide by Black Children Surprises Researchers) teens & adults CONDITIONED by their DEPRESSED, MENTALLY ILL/DISTURBED parental caretakers to BLAME EVERYONE under our sun including POLICE, for their children experiencing a childhood full of depression, FEAR, anger, anxiety, torment, resentment, hate & human dysfunction. I can offer FACTS about America’s Culture of African American Child Abuse/Neglect by describing the abusive childhood White House guest Shawn “Jay Z” Carter, THROUGH NO FAULT OF HIS OWN, was forced to cope with. I can offer FACTS about preteen Shawn Carter witnessing & ENGAGING in gun violence, as well as maturing into an unsupervised, neglected, depressed, unempathetic teen offering ‘people & community’ life-sapping drugs to his depressed neighbors who often witnessed the gun violence Shawn’s crew/posse/GANG engaged in to enforce & protect their 24/7 drug peddling operation. The same gun violence I had the displeasure of regularly hearing or witnessing during the twelve years I recorded &/or investigated criminal complaints filed by peaceful Brooklyn residents whose Quality of Life was seriously OPPRESSED & IMPAIRED by damaged kids maturing into severely damaged teens & adults Kendrick Lamar describes as “Living Wild” human beings. I can offer FACTS about WHY Beyonce Knowles & many WH guests create popular American music artistry informing American children & teens, as well as our foreign neighbors all around our beautiful tiny blue orb that American teen girls & women, aka the MATERNAL half of our population should be viewed as less than human ^itches & ^hores unworthy of basic human respect. I can offer accounts of Child Abuse & Neglect shared by victims like Tupac Shakur who INTELLIGENTLY, HONESTLY & CORRECTLY describes as “T.h.u.g. L.i.f.e.”, a child & life harming concept he so dearly believed in Tupac had those letters BOLDLY tattooed across his once NEGLECTED, hurting, hungry belly. 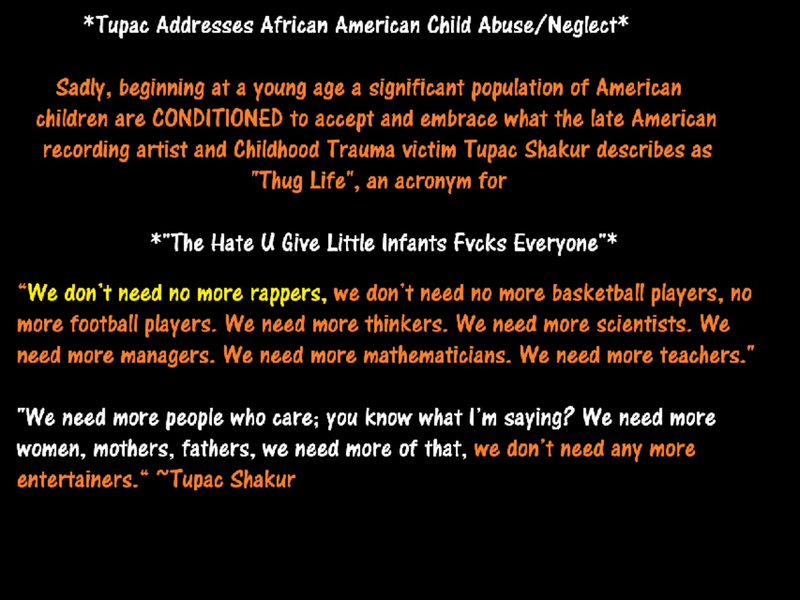 Tupac was well aware that not only are American kids being UNJUSTLY OPPRESSED, IMPEDED & DEPRIVED from experiencing their full human potential, Tupac realized OUR NATION is being deprived of enjoying the potential achievements offered to ALL Americans by reasonably well adjusted kids maturing into responsible teens & adults who care about the future of OUR Nation. Tupac is not alone in recognizing WHO is primarily responsible for neglecting his hungry belly, for failing to place his EMOTIONAL WELL BEING ABOVE ALL ELSE, as well as during a critical period of his childhood/human development depriving Tupac’s young mind from feeling SAFE, cared for & loved. Heeding Tupac’s words, as well as the thoughts, concerns &/or pain shared by a growing number of average Americans who felt compelled to record & share on the INTERNET their opinions about WHO they believe is harming the image of responsible Americans of African descent, as well as harming OUR nation’s most valuable, precious & cherished assets, will NO DOUBT result with more happy children maturing into reasonably peaceful, responsible teens & adults caring about their own well being as well as the emotional & physical well being of their neighbors. Fact is, Mr. Obama & millions of RESPONSIBLE, caring, loving Americans are willfully ignoring the above stated FACTS. It is impossible for me to ignore the wealth of evidence clearly indicating Mrs. Hillary Clinton is a willfully ignorant panderer. For instance, in the early 70s Hillary Diane Rodham worked as a research assistant at the Yale Child Study Center, learning about research on early childhood brain development, and then some years later callously characterized countless victims of America’s Culture of African American Child Abuse, Neglect and Maltreatment as “Super Predators” while IGNORING abusive and often criminal PARENTING that far too often results with Americans like popular urban storytellers, American recording artists, and THROUGH NO FAULT OF THEIR OWN victims of Child Abuse, Neglect & Maltreatment Kendrick Lamar and the late Tupac Shakur to rap or speak about experiencing childhood and adult depression as well as dealing with suicidal thoughts. Unlike Mrs. Hillary Clinton, the late Tupac Shakur, a popular American recording artist, urban story teller, admitted street thug and THROUGH NO FAULT OF HIS OWN, a victim of Childhood Abuse, Neglect & Maltreatment INTELLIGENTLY, HONESTLY & correctly RECOGNIZED that not only are American kids being UNJUSTLY OPPRESSED, IMPEDED and DEPRIVED from experiencing their full human potential, Tupac realized OUR NATION is being deprived of enjoying the potential achievements offered to ALL Americans by reasonably well adjusted kids maturing into responsible teens and adults who care about the future of OUR Nation. Why Are SIGNIFICANT NUMBERS of African Americans Demeaning/Criticizing African American Teen Girls & Women? HOWEVER, I cannot ignore the FACT that for more than thirty years significant numbers of locally and nationally MEGA-popular American recording artists or music performers raised by African American teen girls and women have been demeaning and hating-on African American females. Something is DEFINITELY AMISS when from coast to coast American music performers are creating American music artistry regularly characterizing their moms, sisters, grandmas, daughters, aunts and nieces as less than human ^itches and/or ^hores unworthy of respect. Though when large numbers of musically inclined Americans of African descent are hating on females…evidently THERE IS A PROBLEM! 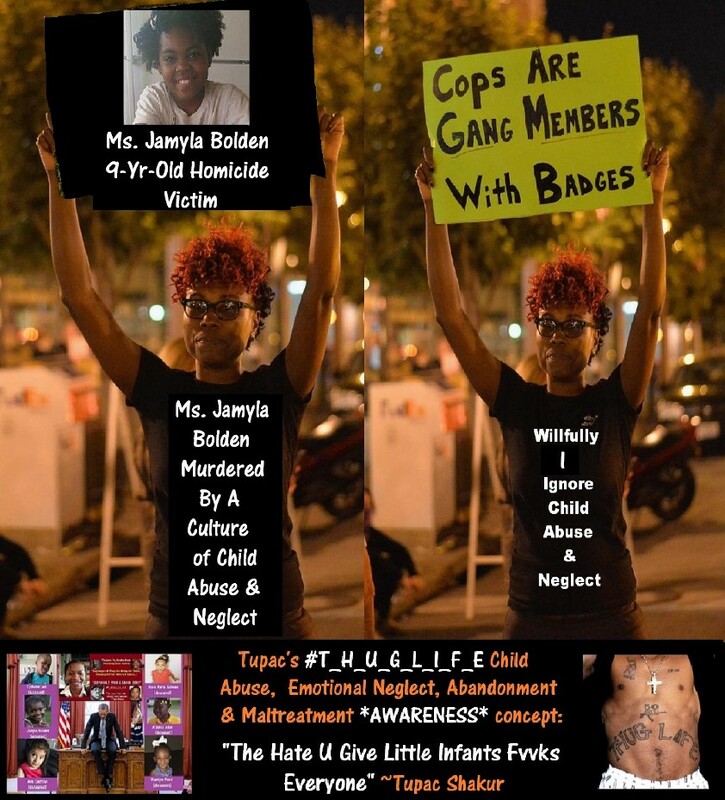 Sadly, there is also a growing population of my responsible African American neighbors producing videos sharing their thoughts, concerns and pain about the population of African American females they believe are responsible for harming the image of responsible African Americans, as well as perpetuating a Culture of Child Abuse, Neglect and Maltreatment. What meaningful ACTION needs to be taken to address the concerns of these seemingly responsible, caring, concerned Americans who felt compelled to identify themselves to our world while intelligently and sometimes passionately sharing their opinions? Sadly, beginning at birth, significant numbers of American newborns, infants, toddlers, children and teens experience OUR nation’s # ONE MENTAL HEALTH DISEASE known as Child Trauma, which far too often seriously impedes their development for maturing into teens and adults who become responsible citizens and/or leaders. Heeding Tupac’s words, as well as the thoughts and concerns shared by Americans who felt compelled to record and share their concerns with our world, will NO DOUBT result with more happy children maturing into reasonably peaceful, responsible teens and adults caring about the well being of others.